Year after year it becomes increasingly difficult for the independent real estate company to compete with national and regional mega brokers who can offer agents resources made available by broad affiliations and large scale buying power. An attractive method to maintain control of your business while offering these programs is to affiliate with Real Estate One as a Real Estate One Associate office. Our franchising division has been helping brokers realize their potential through name recognition while allowing them to maintain local control. 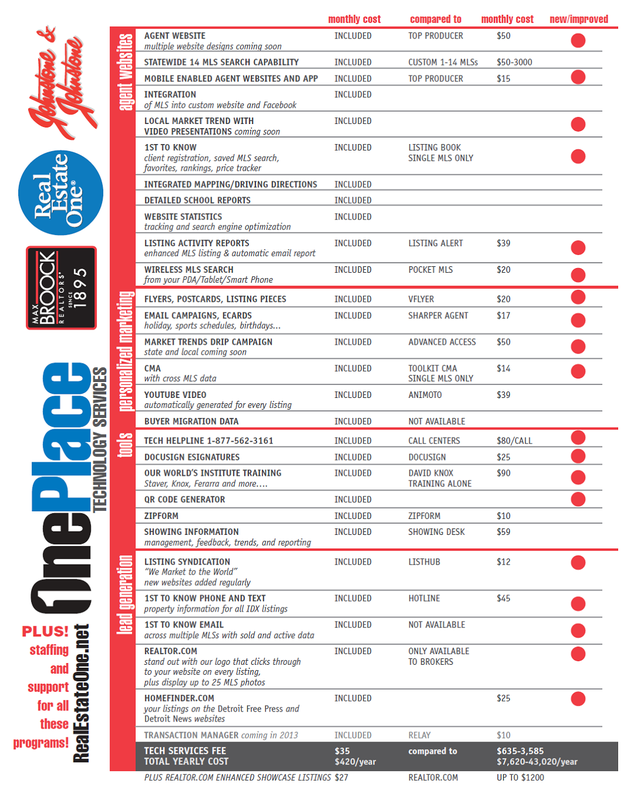 Real Estate One is the largest real estate company in Michigan and the nation's 8th largest full service real estate service company. We are dedicated to providing our franchisees with the latest in tools and resources necessary for today's market while sharing the benefit of our research and market knowledge. Real Estate One continues to grow in strength and recognition across the state and country with the addition of each affiliate office. Learn more about what REO can do for you! The Real Estate One Family of Companies makes the complex process of buying or selling a home as simple as possible. Ranked as the 8th largest broker in the nation, every day is spent striving towards our mission of creating the best real estate experience through our family of services. For the year of 2018, we are also honored to once again be recognized as one of Michigan's Top Workplaces and Best and Brightest to Work For. Since its beginning the company has been known as a market leader. Many of the common marketing tools used throughout the country started here. We evolve as our clients’ needs progress. Our website attracts over 1.9 million unique visitors a year and continues to grow at a rapid pace. We also launched a mobile app, which allowed us to provide GPS-enabled maps featuring a search of Michigan MLS properties. As an affiliate of Leading Real Estate Companies of the World,® our company is a global — not just local — real estate company working on your behalf. 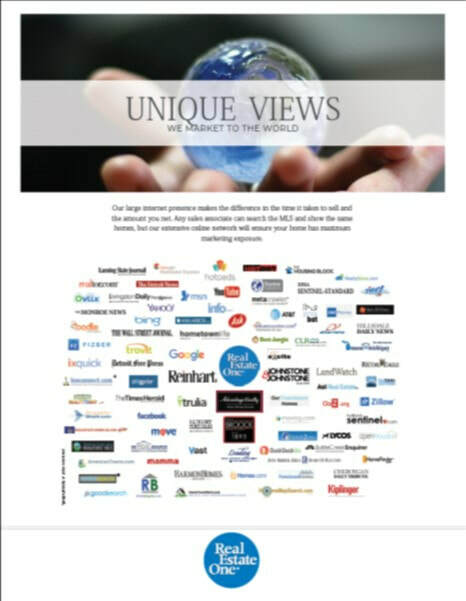 LeadingRE provides world-class marketing and resources, allowing us to provide the very best service. 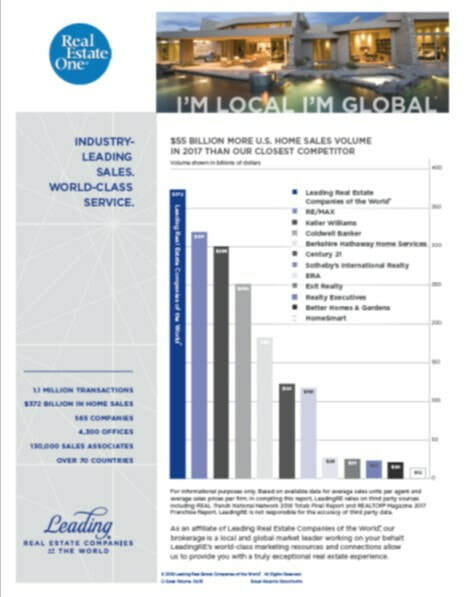 Our organization produced more home sales volume in 2018 than any national real estate network, $372 billion, representing over one million transactions. Whether you are new or an experienced sales agent, Real Estate One Academy offers a variety of quality classes and courses designed to help you build and maintain your real estate career. Real Estate One is based in Michigan and has been in business since 1929. Through every kind of market, we have prospered. 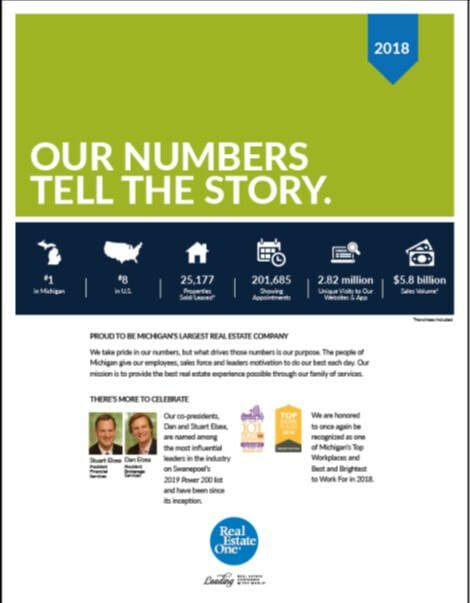 We are the largest broker in Michigan, and one of the largest brokers in the country. Michigan is more than our market. It’s our home.